They almost taste like Reese candy! And they can be done in a jiffy! Quick and Tasty I didn't see them hand-in-hand before. I think deep-down I am snobbish when come to dessert, only attracted to complicated technique and fancy ingredients. But I was so, so, so wrong. Well, it has taken me a few tasting to realize that. 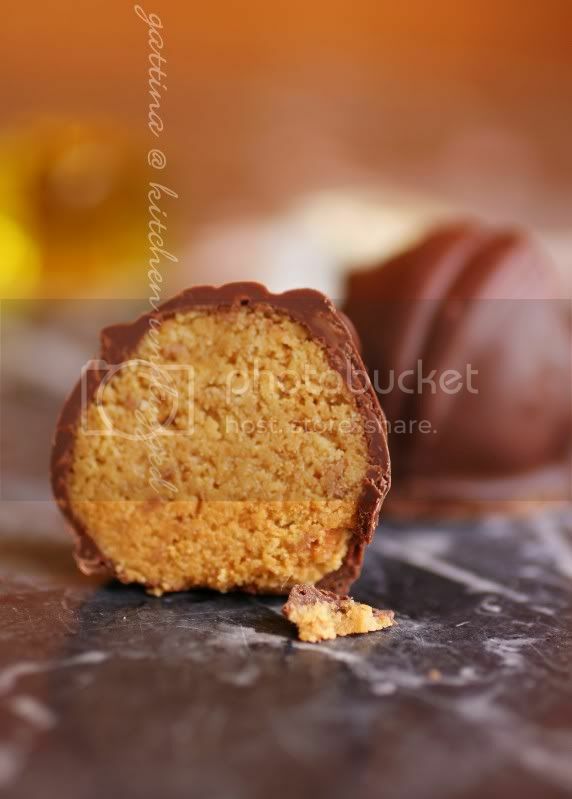 First, one of our friends made Choco-Peanut-Rum Ball. They're done by crushing and mixing chocolate waffler, peanut and rum. "That" sound of it had horrified me. But once I tasted one, then went for another, and another... However, I was "still" skeptical with quick-n-tasty. Another challenge was in Christmas. My niece made"Oreo Ball" - crushing Oreo, mixing with cream cheese, coating with chocolate. Absolutely tasty! I surrender! I love peanut butter, I love chocolate, I love "Reese"... I just luuuuuve quick-n-easy!!! Finely chop 20 g of milk chocolate, then crush it together with the Digestive biscuits until very fine, combine with spoonfuls of peanut butter until they can come together. Taste. Shape balls to a size of small whole walnut. Finely chop the dark chocolate and the 30 g of milk chocolate, melt them over double-boiler or very mild heat, keep stir until they melt. Line a tray with a piece of plastic wrap or wax paper. Dip the balls into melted chocolate, then place them on the tray. Sent them to fridge for 30 minutes or until the coating sets. Enjoy! Mmmhhh, that is fabulous! I love homemade Reese's PB chocolates! Bookmarked!! This sounds fabulous. Excellent photography. Oh Gattina, there's really nothing the matter with quick and easy when the results are "can't stop eating" good! I love Reese Pieces. Super beautiful photo .... such drool! I would never make these - because I would eat them all before I finished. Quick and easy and into the mouth! I've never had Reese PB crunch =( This sounds fab! These little balls look as the perfect treat, Gattina!! I so love all of your unique & grand tasty recipes! Wow! This is beautiful! You can really never go wrong with home made stuff! Yum!! 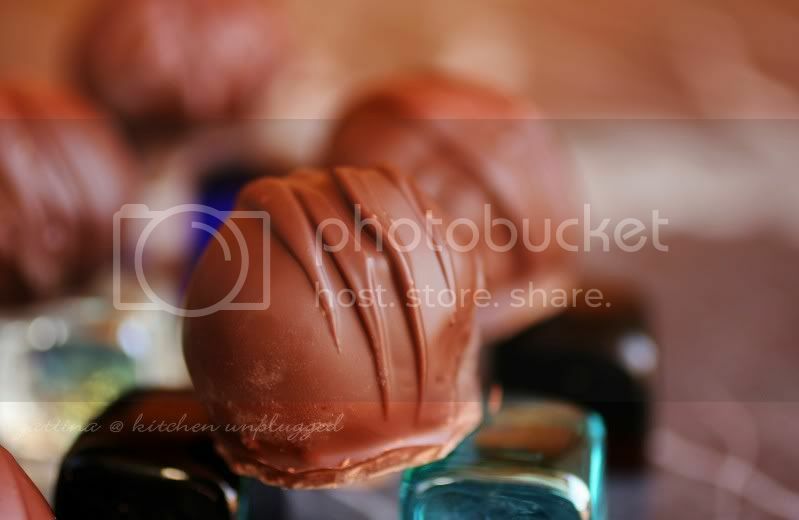 I need these chocolate balls!!! Thanks for the inspiration, Gattina! Quick and easy can also be tremendously good! These goodies are proof of that :) These sound divine...and my hubby loves Reeses! Oh my , i would be eating all of those as soon as i made it too .... they look irresistible !